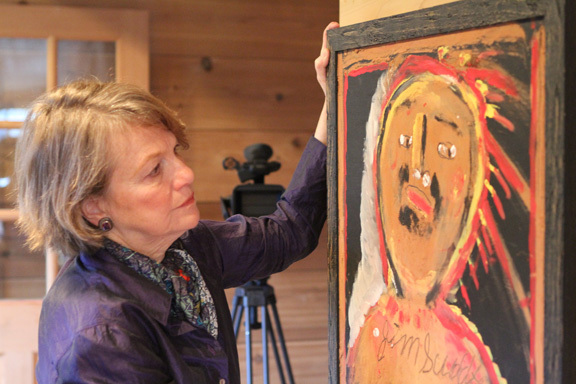 Fayette’s folk art treasures shine again on Alabama Public Television this weekend, with the airing of the prize-winning documentary film “Treasures from the Rubble,” at 6 p.m. Sunday on APT. Alabama-born artist Lois Wilson didn’t like to be told what things should look like in her art. She created her first paintings using shoe polish and scrap tin from her father’s blacksmith shop in Fayette. That nonconformist impulse stayed with her throughout her life, even after she went on to study art in Boston and New York. Table legs, fan blades and even discarded toilet seats became canvas for her paintings. She collected art that followed the same impulses. Wilson helped establish a museum in her childhood hometown with the help of Jack Black, a local newspaperman. Working with Wilson’s collection, Black spent the following 35 years growing the Fayette Art Museum to become a paragon of Southern arts, especially outsider and folk artists. The famed Jimmy Lee Sudduth, who appeared for decades at Northport’s Kentuck Festival of the Arts, is one of the stars in the film, which was shot and edited over about a decade. As he did underneath his pine at Kentuck, Sudduth paints with mud on boards or other simple platforms, plays harmonica and talks about the forces that drove his art, and how he developed techniques. Wilson’s drive — and the partnership with Black — is the subject of the film by Fayette native and independent filmmaker Alexandra Branyon. Branyon lives now in Amagansett, N.Y., but returned to her alma mater, the University of Alabama in 2000 to receive a Distinguished Career Award from the Society for the Fine Arts. Over her career, she’s performed musical comedy for Joseph Papp’s Public Theater, played piano with studio bands in New York City and with a theater orchestra in Honolulu, and taught playwriting at the New School for Social Research, among other work. Anne Perry-Uhlman, director of the museum, was moved by the film. This entry was posted in Press by Samantha Sand. Bookmark the permalink.